Napoleon for Dummies has received critical acclaim and has been translated into French (Napoléon pour les Nuls), Dutch (Napoleon voor Dummies), and Russian (Наполеон для чайников). David Markham’s Napoleon for Dummies is the ultimate biography of Napoleon for the average person and students of Napoleon alike. The book is very easy to read and tells Napoleon’s story in a fascinating way. Readers will have a hard time putting it down once they start reading. But don’t let its easy reading and Dummies title fool you. As he has before, David Markham has produced a book on Napoleon that reflects the highest levels of scholarship and historical analysis. He debunks some of the misunderstandings about Napoleon and puts him in his true historical perspective, all in an easy to understand way. Anyone interested in Napoleon should read this book! In addition to the traditional topics (personality, military and political affairs, relations with the church) David Markham, who is an authority on the Napoleonic era, includes chapters entitled: “Religious Freedom and Jewish Liberation;” “Building a Great (Middle Class) France;” and “Creating New United Europe.” He concludes with sections on ten interesting battlefields to visit; ten pieces of advice for Napoleon; and the ten best sources for further information on the Napoleon era. There is also a Napoleonic time-line at the end, along with maps and an index. Markham has made Napoleon informative, interesting, and enjoyable reading. It could have been entitled “Everything you always wanted to know about Napoleon, but had no one to ask.” The book is an excellent addition to the “Dummies” series and highly recommended. This book is a treasure trove of Napoleonic information, and explaining the complex exploits of the great leader in such an enjoyable and clear format is a truly remarkable achievement! The author writes as if he is engaged in a conversation with the reader rather than as a noted scholar. He keeps the sections in each chapter long enough to convey the important information, but short enough to keep the casual reader’s attention. The text is interspersed with dry humor that takes on a rhythm of its own, which when combined with the numerous cartoons which place Napoleon in humorous or absurd situations will keep the reader amused. Although Napoleon for Dummies contains much information, its appeal will be to the reader with a passing interest in Napoleon or to the student doing basic research. It is a very useful as a general reference on Napoleon and I strongly recommend it for high school libraries. J. David Markham’s latest book, Napoleon for Dummies, is the perfect book for someone who wants to get the lowdown on Napoleon. It combines outstanding scholarship (Markham is a top international Napoleonic scholar and award-winning author) with the easy reading style associated with the Dummies series, and takes the reader beyond the stereotypes and to the real Napoleon.... As one would expect, Markham writes in an easy, accessible style that should appeal to all readers. The book is well-organized and easy to follow. In his introduction, Markham explains why we should even care about Napoleon, giving examples of why that great man was important both to people of his time and to those of us living in the 21st century. Markham makes Napoleon even more accessible by including 70 engravings from his personal collection. It is always better to have a visual image of the people about whom one is reading, and this book does an outstanding job in this area as well... In short, if you want to read a really good book on Napoleon, or if you just want to read a really good book, I highly recommend that you try Napoleon for Dummies. 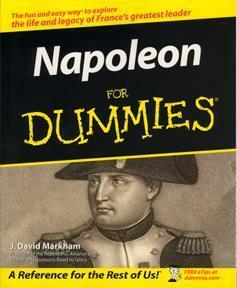 The For Dummies series made a brilliant choice in choosing J. David Markham to write this Napoleon for Dummies. Although this book is by its nature a popular history, its author is nonetheless one of the world’s most internationally recognized Napoleonic scholars. Markham’s writing style is easy to read and he covers his subject in a way that is both informative and fascinating. He gives excellent coverage to the normal topics covered in a biography of Napoleon, and adds significant “in depth” discussion of other topics as well. Throughout it all, Markham gives the reader the best over-all portrait of Napoleon that I have seen in any biography of one of history’s most interesting and complex leaders. David Markham’s Napoleon for Dummies is an excellent introduction to anybody interested in Napoleon and his age. The author, a prolific Napoleonic scholar and the president of the International Napoleonic Society, has produced a very accessible and engaging work. Markham describes very clearly the important topics and events of the Napoleonic years including, Napoleon’s youth, his rise to power, the numerous wars and military campaigns, the treaties and geo-political changes in Europe, the Napoleonic Empire, his reforms in France, Napoleon’s Jewish policies, and the fall and final years of the French Emperor. Moreover, the book presents the important personalities, both Napoleon’s allies and enemies, who played a significant role in the developments of those years. Markham provides a clear picture of the significance and the legacy of Napoleon. The last three chapters of the book provide the reader with useful and practical information: “Ten Interesting Battlefields to visit” (Chapter 24), “Ten Pieces of Advice for Napoleon” (25), “Ten Best Sources for Further Information”(26). The text is accompanied with numerous pictures and closes with two maps of Napoleonic Europe, a helpful time-line, and an index. In sum, it is a very good addition to the “Dummies” series and I recommend it to all students of the Napoleonic period. Over almost two centuries after the death of Napoleon, his genius, charisma and dazzling campaigns remain as magnetic as ever. Among the many books on Napoleon, his battles, everyday life, and on the personalities and armies of this epic period of history, this outstanding work of David Markham fills a notable gap in providing an overall information that gives the reader a solid base of carefully researched facts on a vast range of topics. The structure of Napoleon for Dummies, in my opinion, represents a sort of “the book within a book” or multi purpose book (6 parts and 26 chapters) that permits the reader to realize his preferences by choosing chapters that he finds extremely interesting to be read first, and others - to be read later, following the famous “Hamlet’s” principle “to read or not to read.” I very much appreciate this approach of the author and find it perfect, especially for young people, but really for readers of all ages. So the reader has in this research at least 6 great books compressed in one. Like a perfect magician David Markham sometimes converts and unites unlikely different categories; for example, art, science and canons in one chapter providing the reader the profound understanding of this transformation during the most romantic period of Napoleon’s life. The harmony of textual material supplied with small but very informative pictograms together with abundant pictures by great artists of the epoch, maps and a condensed chronology of Napoleon’s everyday life makes the book a finished masterpiece. The index represents a concise, invaluable reference work on all aspects of a great life of the most charismatic man in the world and series of wars that gripped Europe during the two decades following the French Revolution. It was a good idea to write such a book because it covers all topics related to Napoleon’s career and his life. Besides it is not only for dummies. I am sure that any reader including Napoleonic scholars will find it brilliant. The manner of narration, easy reading style, together with lots of rare illustrations makes David Markham’s book an outstanding contribution to the great literature about Napoleon. If the Emperor were alive, the glance of his gray eyes would have appreciated Napoleon for Dummies by David Markham.